During the Viking age, Norse people apparently did not create art for art's sake. There are few examples of decorated objects having no purpose other than to display their ornamentation. 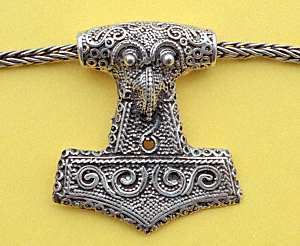 Instead, Norse art is characterized by extraordinary ornamentation of everyday objects. Even the humblest objects are elaborately and unrestrainedly decorated. Silver beads and wires were welded to the silver surface to create the brooch shown to the left. 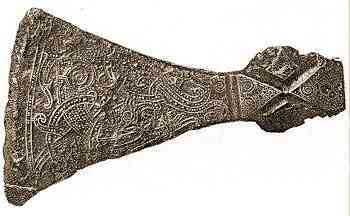 The axehead shown to the right was decorated by cutting groves into the iron axehead, then pounding a contrasting silver wire into the groves to create the design. Something as mundane as an ear scraper (a replica based on a historic find is shown) is decorated with a head and a hand on its backside (below). Many everyday objects were decorated in ways that required high levels of skill on the part of the artist. The historical carved wooden object shown to the right was probably a medallion worn around the neck for personal adornment. The object, about 40mm across (1½ in), has detailed, deep-relief carving. 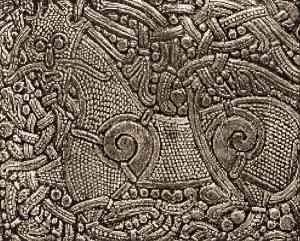 During the Norse era, various styles of artistic decoration were developed. These styles were used for jewelry as well as a wide variety of other decorative items, such as the decorative mounts shown to the left and below. It is customary to divide the sequence of Norse art into six successive styles. A particular style lasted for a period of time, but was not immediately replaced by a new style. Rather, the two styles coexisted for a period of time. It's remarkable how quickly new styles overspread the entire Norse sphere of influence. Clearly, communications between the various parts of the Viking world was excellent, and new artistic styles were carried from place to place and were readily adopted. Oseberg: This style was used during the first three-quarters of the 9th century. 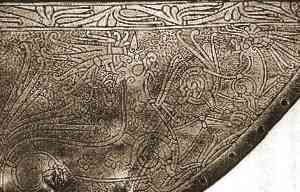 The "gripping beast" motif, first seen in pre-Norse art, is fully developed, and the designs are arranged in a carpet-pattern manner. The sketch to the right shows a detail from a carving on the Oseberg ship. 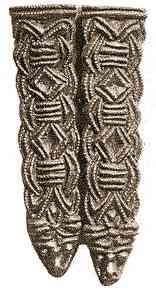 Borre: This style was used from the last quarter of the 9th century to the mid-point of the 10th. It features mask-head like animal heads, pretzel shaped bodies, and gripping paws. While other styles of Norse art show exterior influences, the Borre style appears to have been fully created in the Norse home lands. Samples have been found that were produced in Iceland, England, and Russia, showing the extent to which the style spread across the Norse dominions. 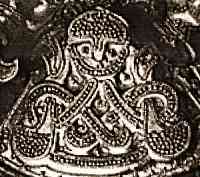 The sketch shows a detail from a woman's brooch. Jelling: This style first appeared at the beginning of the 10th century and continued through the third quarter of the 10th century. Animal shapes are "S" shaped and are intertwined to form an open interlace pattern with diagonal symmetry. 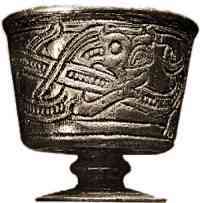 The sketch shows a cup found in Jelling, Denmark. Mammen: This style flourished in the last half of the 10th century. 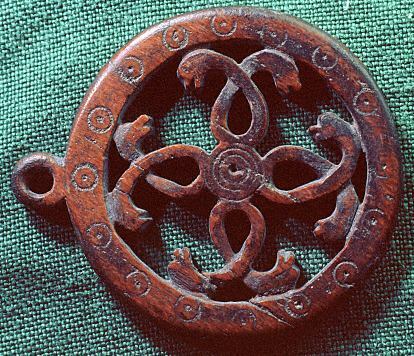 Seminaturalistic lion and bird motifs, based on European prototypes, were used, along with the familiar Norse serpent. Characteristically, one or two large motifs fill a panel, with asymmetric scrolls and ornamental lines. The sketch shows a detail from a casket lid, carved in elk ivory. Ringerike: This style dates from the first half of the 11th century. Lion-like beasts continue to be used, but with tightly clustered tendrils forming their manes and tails. Plant motifs are also used with foliate patterns. The sketch shows a detail from a weather vane, probably from the prow of a ship. 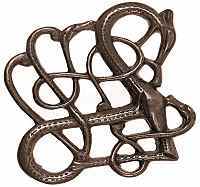 Urnes: This style was used from the middle of the 11th century well into the 12th century, and it represents the last Norse art style. Extremely stylized animals are used, with heads and feet reduced to mere elongated terminals. Figure-eight and multi-loop compositions are employed. 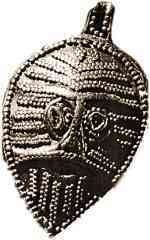 The sketch shows a silver brooch from Iceland. It has been pointed out that Norse poetry and literature share some of the same complexities as Norse art. In art, exceedingly complicated forms are used all over a figure to create a single unified image. Similarly in literature, multiple plot lines are developed and abandoned, only to be taken up again in order to create a single, unified dramatic narrative. It's been suggested that this similarity between poetry and visual arts derives from the same underlying sensibility in Norse culture: some innate appreciation and enjoyment of these ornate, baroque forms.